Blogs can be a great source of inspiration and information (which is hopefully why you’re reading this one). But have you thought about ways to make use of bloggers in your area to promote your business? We recently hosted a blogger competition, and were pleased by the response. Hopefully you could make it work for your shop too. There are an amazing number of blogs being posted every day. In fact, according to a blog for Hat Trick Associates, when non-English blogs, especially those in Chinese Mandarin, are included there may be over one billion blogs worldwide. Some of these are business blogs — perhaps you write one for your shop — but the vast majority are written, and read, by individuals. Blogs allow the writer to have great influence while maintaining complete independence. This makes the bloggers opinions the equivalent of “word of mouth” advertising, which has always been the most prized and difficult type of promotion to procure. Chances are good that there are bloggers in your area writing about your type of merchandise, whether it is clothing and accessories, art or gifts. If you carry products for children, you undoubtedly already know of the army of “mommy bloggers” who are a particularly active segment of the blogosphere, as are fashion bloggers. We decided to take advantage of two facts that we learned from reading Danish food blogs: bloggers love to get together, and blog readers love contests. We recently hosted a local food blogger evening at Orange Tree Imports with wine and a taste sampling, and while the writers were there we gave them a tour of the latest and greatest cooking items in our store. Before they left each one got a goodie bag of kitchen tools provided by three of our suppliers. 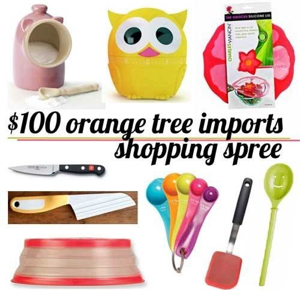 The blogger contest we sponsored was based on the question “If I had $100 to spend at Orange Tree Imports, what would I buy?” Each participant wrote a carefully thought-out and well illustrated blog entry listing their favorite kitchen items, keeping within the $100 limit. 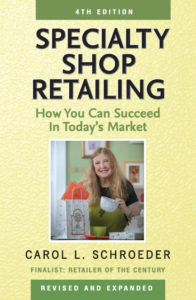 They invited their readers to come into the store to enter a prize drawing for a $100 spending spree, and the blogger who has the most readers enter the drawing will also win a $100 gift card. We promoted all the entries through our social media, as did the bloggers, so we know that they got wide readership. The total cost to us for this promotion, beside the gift cards, was the refreshments for the evening event. The resulting PR: priceless.